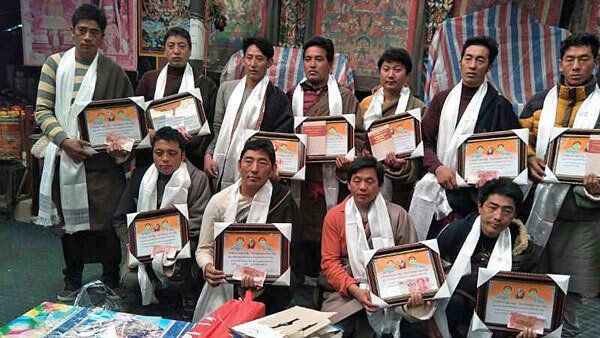 (TibetanReview.net, Jan28, 2018) – Despite known official antipathy towards any such action, hundreds of Tibetan language advocates from three provinces in what is part of the People’s Republic of China have attended a conference on Tibetan language and modern terminology on Jan 25 in an initiative to protect their culture from growing assimilation under the current political dispensation. The name of the three provinces has not been named, except possibly Qinghai in which the conference was held. The conference, whose organizers did not seek permission from Chinese authorities, was held at the Jonang sect monastery of Tashi Choeling in Chigdril (Chinese: Jiuzhi) County of Golog (Guoluo) Prefecture, Qinghai province, reported the Tibetan Service of Radio Free Asia (Washington) Jan 26, citing a local source speaking on condition of anonymity. Apart from holding discussions, competitions were held to test the memorization and usage proficiency of newly coined Tibetan terms listed in Tibetan encyclopedias, as well as competency in the everyday use of the language and phraseology, including new science and technology words, the report cited the source as saying. The winners were given awards. The source has also said there was consensus among the participants that the mixing of Tibetan and Chinese languages in various Tibetan communities in daily interactions amounted to diluting and undermining standard Tibetan and should be discouraged. The age of the participants, consisting of lay Tibetan men and women, were said to range from seven to 60 years old. They were said to include representatives from many voluntary Tibetan language associations that had sprung up in the past several years to promote Tibetan language. With the instructors spending hours to provide lessons on the social media platform WeChat, many Tibetans were said to have become literate through the help of such volunteer teachers. Under its so-called bilingual education system, China allows Tibetan to be taught in Tibetan schools only as a language subject, with everything else being conducted in Mandarin Chinese. China has previously detained and punished organizers and teachers of Tibetan language courses, calling them “illegal associations”. And earlier this month, authorities in Qinghai’s Yulshul (Yushu) Prefecture tried a Tibetan shopkeeper and language activist Tashi Wangchuk on charges of “inciting separatism” for advocating the promotion of Tibetan language. He faces a possible 15-year jail sentence, although no date for a verdict has been announced so far.